Despite major efforts, the number of tuberculosis (TB) cases in Greenland has continued to increase since the 1990s. In 2014, the TB incidence rate for Greenland was 200 cases per 100 000 population, whereas the average rate for the 53 countries in the WHO European Region was 37 cases per 100 000, and that for Denmark was 7 per 100 000. In contrast to Greenland, TB rates in the WHO European Region have been falling by an average of 5.2% per year since 2010, the fastest decrease in the world. Of added concern is that, in recent years, children and young people have had 21% of reported cases of active TB in Greenland. Children become infected more easily than adults and have been exposed to infection for only a limited time before diagnosis, whereas adults can carry the infection for a number of years without developing TB. Therefore, the high number of infected children indicates active spread of the disease. Previous studies have shown that several socio-medical factors influence the development of TB in Greenland. As in other countries, the risk for TB is much greater for people who are less well off. Those at greater risk include residents of small villages with no access to running water, baths or flushing toilets; the unemployed; and people who consume more than average amounts of tobacco and alcohol. There is also evidence of increasing spread in towns. Homelessness can make compliance with the long-term treatment of TB extremely difficult. At the request of Greenland's Ministry of Health, a team of experts from WHO/Europe, the Danish Lung Association and Statens Serum Institute Denmark are visiting the island on 5–11 June 2016 to evaluate the country's efforts to address the increasing number of TB cases. The visit is a follow-up to an assessment mission by WHO/Europe and partners in April and May 2010. 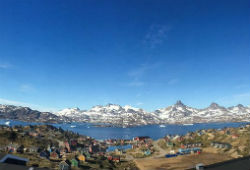 After a briefing at the National Board of Health, they are travelling to large and small communities across Greenland to meet TB doctors and nurses in hospitals and health centres, laboratory staff, municipalities, teachers, social services, patients and families, to assess the situation and advise on action to stop TB. Sustained focus on TB, both politically and in the population, is an essential component of strategies to tackle the disease. Other vital elements are early diagnosis; effective medical treatment, with supervision, monitoring and reporting based on internationally recommended indicators; complete, effective contact tracing; and in-service training and research for medical staff. The team's findings will provide feedback for the Government of Greenland's National TB Strategy 2012–2016. During their travels, the TB team will be reporting back regularly on their meetings and experiences. Follow them on #TBchat. Tuberculosis, or TB, is an infectious bacterial disease caused mainly by Mycobacterium tuberculosis; it most commonly affects the lungs. It is transmitted from person to person via droplets from the throat and lungs of people with active disease. In healthy people, infection with M. tuberculosis often causes no symptoms, as their immune systems act to "wall off" the bacteria. The symptoms of active TB of the lung are coughing, sometimes with sputum or blood, chest pain, weakness, weight loss, fever and night sweats. TB is in most cases treatable with a 6-month course of a combination of antibiotics.